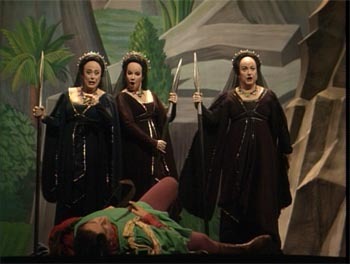 It seems to be “looking back at older Metropolitan Opera productions” week here in the blogosphere. Over at The Earworm there’s a series of posts on a 1980 production of Don Carlos. Our subject will be the 1991 Die Zauberflöte. 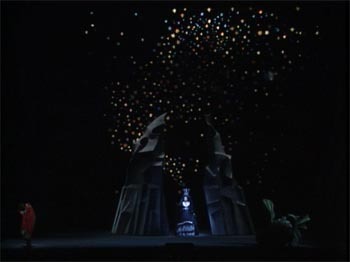 The production was designed by David Hockney and the look varies from the whimsical; the opening scene, to the grandiose; the final scene, with bits of Egyptiana in between. It’s very handsome. The direction is described as “original direction” by John Cox and “direction” by Guus Mostart. I’m not entirely sure what this means as there doesn’t really seem to be a production concept and the Personeregie is pretty basic. Basically it looks like acting is considered to be an optional extra. Some of the singers are good actors and some don’t even try. There’s no consistency. The impression is that the “production” is just a backdrop for the singers to do their thing. The singing is consistently excellent and where it’s backed up by some acting it’s very satisfying. 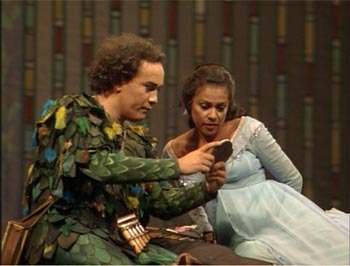 The stand outs are the Pamina of Kathleen Battle and the Papageno of Manfred Hemm. They are both stylish singers with plenty of power and really bring their characters to light. They also have great chemistry together. Elsewhere it’s a bit wooden with a lot of “stand and deliver”. The opening scene, for instance, never rises above farcical and the trio of rather mature looking and sounding Ladies come off rather as three matrons at the country club squabbling over the new pool boy. Francisco Araiza looks and sounds right for Tamino but isn’t very dynamic and much the same could be said for Luciana Serra’s Queen of the Night and Kurt Moll’s Sarastro. In some ways it’s a bit odd as the supers are clearly very carefully directed and one feels that if a bit more effort had gone into directing the principals the result would have been exceptional. James Levine conducts and gives a pretty dynamic reading of the score. It all sounds a bit heavy to me but then I’m not really used to Mozart with an orchestra like the Met’s. It’s definitely closer to Klemperer than Gardiner. The video direction by Brian Large is very good for the period. We get a pretty good view of the sets and the staging and there weren’t too many occasions when important things appeared to be happening out of camera shot. The picture is also pretty good. It’s 4:3 with good colour and enough detail to support the overall painterly look without having the sharpness of a more modern recording. The sound, PCM stereo, isn’t so wonderful. The singer/orchestra balance is good but the sound seems bass heavy and over reverberant. At a couple of points Manfred Hemm sounds like he is singing from the bottom of a well. Also, there’s a lot of fairly intrusive applause and a fair bit of coughing (which I suppose says something for the fidelity of the sound recording). The disc “package” is decent. The menus and credits have a fun Hockneyesque look to them. The booklet (trilingual) is a bit basic with a synopsis and chapter listing (plus credits down to the carpenter and the electrician). There are no extra. Subtitles are English, French, German and Chinese. Overall this is well worth a look, especially as a kind of last hurrah of the pre-concept, pre-acting days of opera. It’s not going to replace the more recent Salzburg or ROH versions in my affections though. This entry was posted in DVD review and tagged araiza, battle, cox, dvd, hemm, hockney, large, levine, metropolitan opera, moll, mozart, serra by operaramblings. Bookmark the permalink. An excellent review but I still haven’t seen any better than the Pamina of Kathleen Battle and the Papageno of Manfred Hemm. They keep me coming back to this production. Which Salzburg production are you referring to? 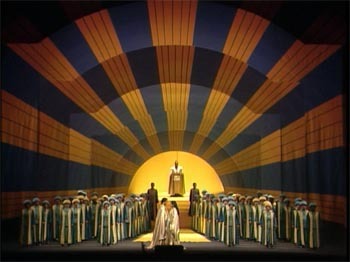 The Salzburg production was the 2006 Pierre Audi version. My review here. Also, totally with you on Battle and Hemm. Excellent! I may have to take another look at Battle’s Zerbinetta too now. I do have a soft spot for Keenleyside’s Papageno on the 2003 ROH recording. It’s completely idiosyncratic but rather compelling. I like the ROH one too – both musically (agreed re: Keenlyside) and the way it looks. The production itself is very pretty but interpretively undemanding and one can just focus on the music. I saw this in house and found Hockney’s set didn’t really work unless you were sitting dead-on. Also the Q of N treatment was kind of a non-event, which should never be. Wish they’d gotten the Chagall production on tape instead. Maybe that’s why Large doesn’t muck about with the angles as much as usual. Great review! This “Flute” is a mixed blessing, but I’ve always enjoyed it anyway, not least because it was the first complete “Flute” I ever saw on video. Gotta write my own review of it one of these days!